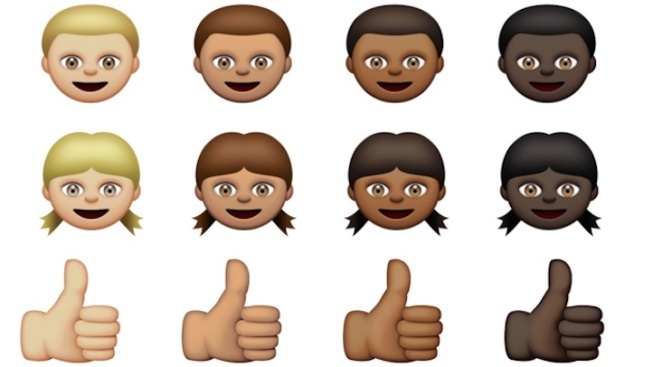 Emojis are coming in all skin tones. According to TechCrunch, Apple has been testing out the newest beta version of iOS 8, which will feature an emoji update that will allow users to choose from six different skin tones. Developers who have seen the new additions have been posting screenshots of the emojis, which also feature a yellow skin tone that some slammed as intending to represent Asian people. One Apple developer noted that the yellow emoji is not supposed to represent Asians, but it's the "default emoji yellow." The skin tone choices are only available "when applicable." There's also a larger variety of country flags and emojis to represent different types of families, plus the iPhone 6 and Apple Watch have been added to the catalog. The new, racially diverse emojis are reportedly going to hit the general public in March. "Apple supports and cares deeply about diversity, and is working with The Unicode Consortium to update the standard so that it better represents diversity for all of us," an Apple spokesperson said in a statement.